40 minutes earlier – I enter the office of Y-san. It instantly takes me back to Japan. Fluorescent lighting, old gift boxes used for document storage fill the space between metal cabinets and the ceiling, and numerous calendars hang from the walls. Japanese offices seem to be the opposite of Zen. I cannot step inside the tiny office, a dog is sleeping on a huge pillow in the entrance. Like a genkan (玄関), the lower part of the Japanese hallway, marking the passage from the exterior to the interior. I introduce myself to the Japanese garden designer (and builder), hoping he can offer me a job or refer me to someone in his network. As soon as he realizes my Japanese is half-way decent, he switches to Japanese and a my teleportation to Japan is complete. Not only that my understanding in Japanese is OK, but still not as good as English, but it is also the Japanese way of thinking and constructing thoughts and sentences, which creates a verbal vagueness I haven’t experienced since I left Japan in January 2013. We talked about the main points of Japanese garden design, rock shapes in modern and traditional Japanese gardens, and what I could do to advance my studies. 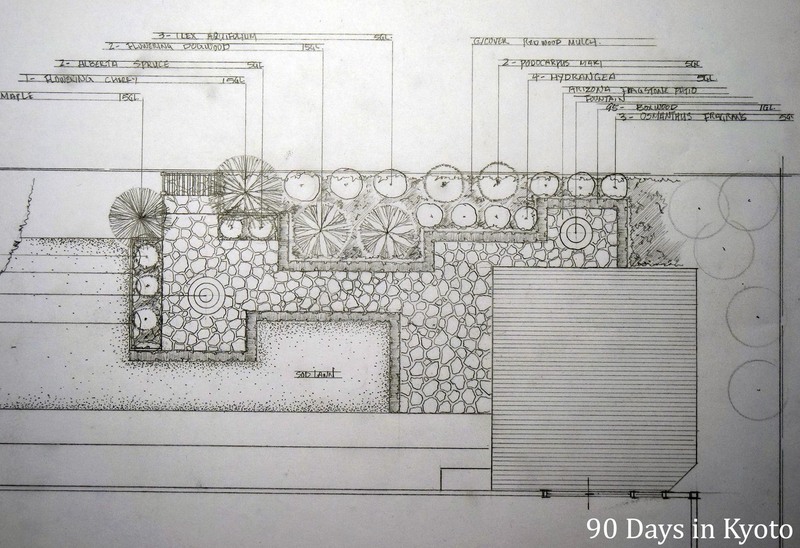 He asked me whether I could design a Japanese garden. I answered that No, I could design modern western gardens, but I have never designed a Japanese garden before. As a reply, he opened one of the drawers in the metal cabinet, which was overflowing with semi-transparent papers, rolled loosely. He grabbed a good handful and handed them to me, telling me to copy them. I was not sure whether I understood correctly: Copy? Now? – No, not now of course. Take them home and copy them, and return them, when you are done. I felt like the Karate Kid receiving instructions from Mr. Miyagi. OK, I said, and under many thanks and bows, I made my way out of his office. This was surreal – not a lot, but enough to leave me wondering whether I understood alright. At home, I checked whether they are “honmono” (本物) – the originals, the real thing. Yes, they are. They all look great! Incredible! Drawn in very fine pencil lines, with an incredible amount of detail. I was, and still am, afraid to start copying the plans. I put them in the drawer and left them there. I bought new super-fine mechanical pencils. But I did not touch these plans. 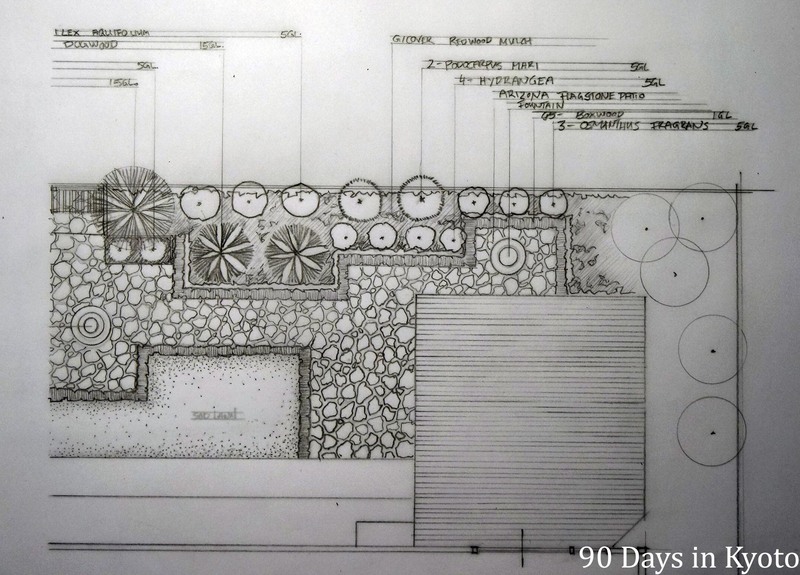 I like garden design drawing, but often feel my plans lack detail and refinement. What if mine won’t look as cool as his? What if I really give it my best and they still don’t compare? There is a lot of room for improvement, especially with the pencil thickness. But I am getting the hang of it, so I will keep at it.